Above 23 cm contacts to VK from the far north, also VK2DVZ on 23 cm. Right: Red is 144 MHz and Purple is 23 cm or 1296 MHz. Two internal tropo contacts from Cape Reinga. 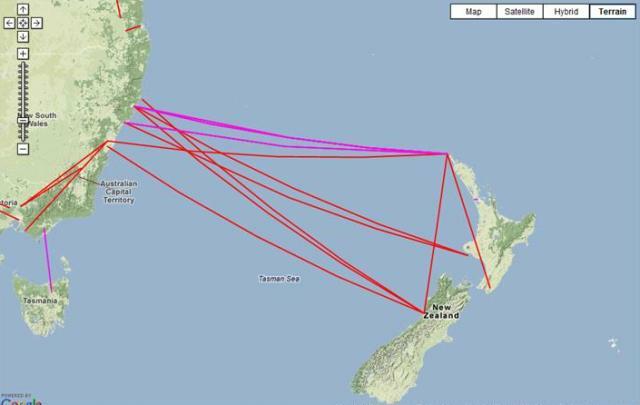 Chis ZL2DX out of Wellington and Bob ZL3TY in Greymouth. Below pictures of the 3 cm (10368 MHz) ZL internal record and pictures of the team that were involved. 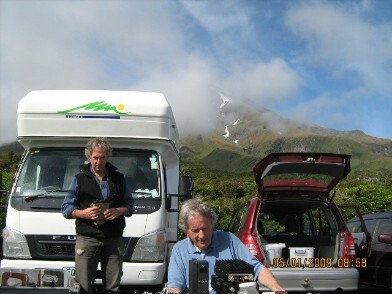 Above: from the Taranki end L to R: Ray ZL2TAL, Ted ZL2IP and Ian ZL2IH. 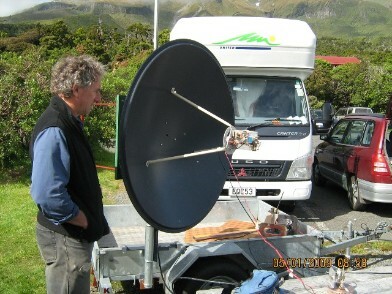 Setup is a 1.2 metre dish on 10 GHz. Harry ZL1BK was also there and took the photographs. 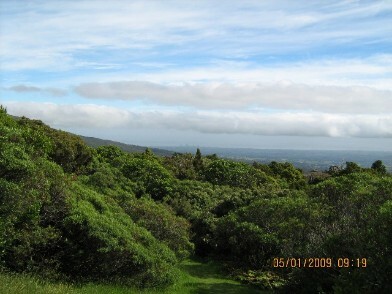 Above: The view from Mt Tarinaki. 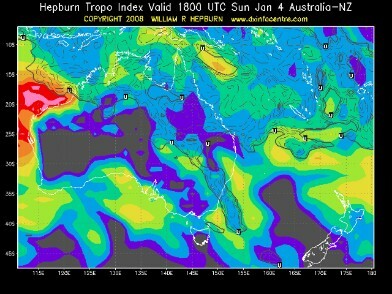 Note the low cloud cover for tropo. The Hepburn chart shows tropo within the top half of ZL. 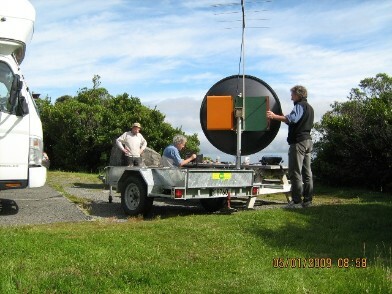 Above; Simon ZL1SWW (and family) assisted as part of the team effort from Cape Reinga with 3 cm. Above Ian ZL2IH and Ted ZL2IP operating 144, 1296 and 10 GHz. 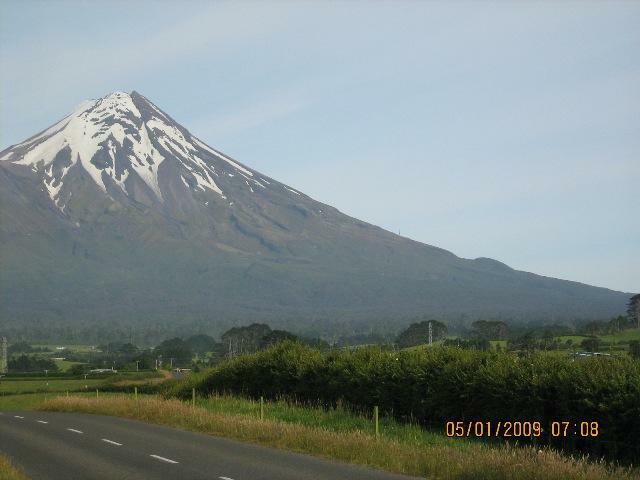 Above: The view from Cape Reinga pointing south towards Mt Taranki at 551 km. Note also the low cloud cover. Above: From Cape Reinga. DB6NT 5 Watts small dish. 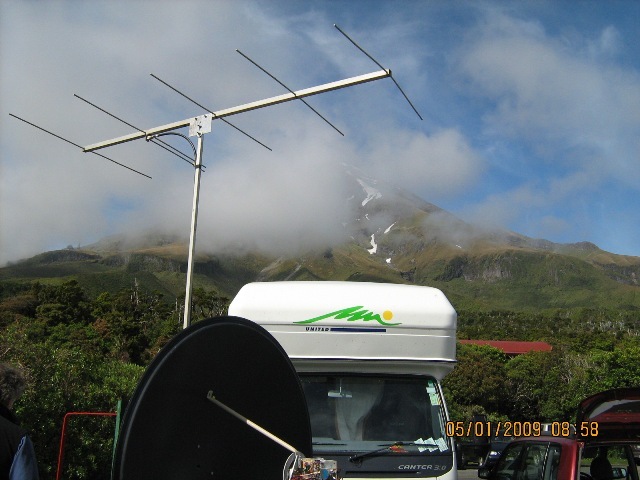 Above: Worked Bob ZL3TY on 2 m at 903 km from Cape Reinga. We tested 1296 MHz but nothing received both ways. While beaming Sth ZL on 1296 MHz was heard by VK2DVZ at 1900 km. My station; 250 Watts on 2 m and 150 Watts on 1296 MHz. Small Yagi's only required with tropo. Beam heading with this picture was to VK2 from Cape Reinga. This was the site I worked Bob ZL3TY on 2 m (QSL card on left) and also in the log was Chris ZL2DX, also on 2 m at 800 km beaming Sth ZL.